Yah, I keep thinking I need a sign in order to get it together. I need to see a falling star. The planets aligning. The first fingernail of the new moon. An even numbered day at the beginning of the week. A bad number on my sugar count. Maybe really bad results at the health fair with, say, cholesterol climbing sky high. Something. Any sign. Well, easy enough. I just googled what I needed and found tons of signs! Love this one! It’s actually the one that sparked this post. In fact, it shocked me when I first read it because it’s so dang true! This one is obvious! You know it’s at least a quarter past time to change! See, I’ve had motivation before. But each time I reach a goal, I forget about the habit part. And, I need to remember this. Always. I’m in the middle of that scribble on the right. See me? So, forget about the falling star or the first fingernail of the new moon, an even numbered day at the beginning of the week. 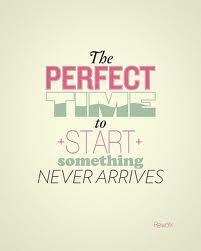 Just realize that if I keep waiting for the ‘perfect time’ to start, I’ll most likely be buried in a size XXXL! Oh, sorry. That was grim!